Bad news, everyone: Potomac Phil saw his shadow on Saturday morning, meaning six more weeks of winter. But wait — didn't Punxsutawney Phil say the opposite? 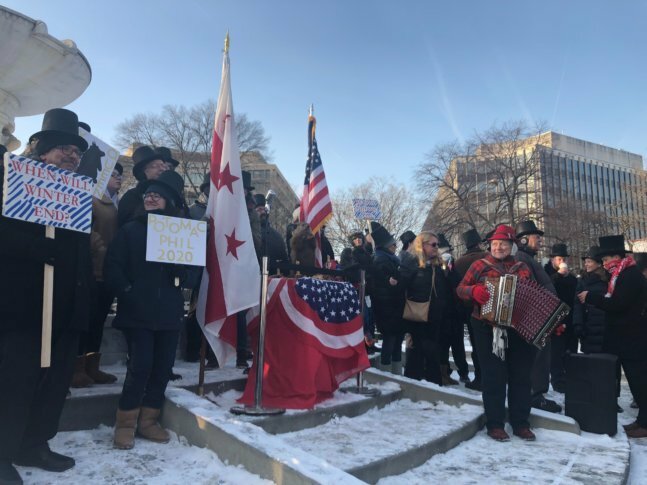 WASHINGTON — While hundreds gathered in rural Pennsylvania for Punxsutawney Phil’s annual weather prediction, his lesser-known, somewhat lesser-animated cousin had his own ceremony in D.C.’s Dupont Circle. Bad news, everyone: Potomac Phil saw his shadow on Saturday morning, meaning six more weeks of winter. Unlike Punxsutawney Phil, Potomac is a stuffed groundhog — “taxidermy is a dying art,” its Twitter page said on Saturday. But like his more animated cousin, D.C.’s own Phil has throngs of adoring fans willing to brave the cold for a hand in the festivities. The far more lively Punxsutawney Phil, meanwhile, didn’t see his shadow up north — setting the stage for months of groundhog gridlock. Punxsutawney Phil could not be reached for comment.